Make marinade: Combine soy sauce, pomegranate juice, sugar, garlic powder, five spice powder and ginger powder and mix well. Pour over cleaned pork tenderloin and marinade for several hours to overnight (the longer the better! ), turning occasionally. Drain pork fillet from marinade. Drizzle peanut oil over top of tenderloin. Prepare the glaze. Combine juice and sugar in a saucepan over medium heat, then bring to a boil. Boil until it reduces significantly (around 1 cup), approx 6-8 minutes. It should still be a little watery. Pour half of glaze into a small bowl, add the arils and set aside. Put pork on wire rack over foil-covered baking dish. Brush pork with half of the glaze in the saucepan. Baste pork with remaining glaze in saucepan and reduce oven to 375F. Meanwhile, return the set aside glaze to the saucepan and keep on a very low heat to thicken until it is time to serve. Remove from oven, put on board and allow to rest. Cut pork into diagonal slices and drizzle with the set aside glaze. Serve over a bed of rice with steamed green vegetables such as bok choi or green beans. This recipe is a family favourite - both in my immediate family and now in the Eat, live, travel, write household. When my sister and I are at home or when mum and dad are visiting us, we always ask mum to cook this dish - it's become a classic. Luckily I pretty much know the quantities off by heart since mum's recipe is looking a bit faded these days (photocopied I believe in 1991)! 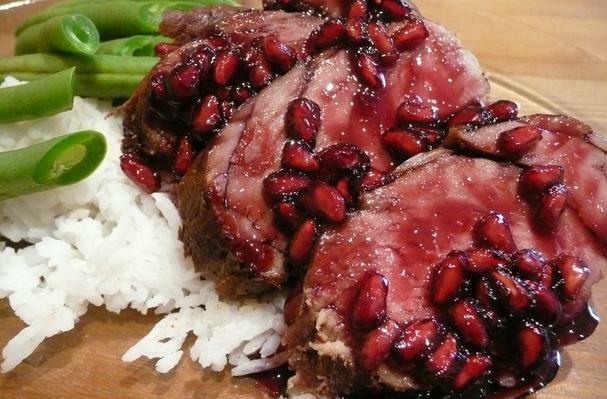 As I originally entered this in the POM Fresh Recipe Contest, I decided to make it as per mum's recipe but replace the hoisin sauce in the marinade with POM Wonderful juice and add a pomegranate glaze with arils for basting the pork whilst is is cooking and to serve. Marinading the meat in the juice and using it as a glaze really highlights the flavour and the pomegranate juice works so well with the Asian spices.